TACLOBAN CITY, Leyte – The first joint assembly of the Region Eight Administrators League and the Regional Development Council of Eastern Visayas is scheduled to be held on September 25, 2012 at the Matapat Hall of the Police Regional Office 8 in Camp Ruperto Kangleon, Campetic, Pawing, Palo, Leyte. Department of Budget and Management Region 8 Director and REAL president Imelda Laceras informed that the Joint Assembly is a convergence of collaborating agencies such as the Eastern Visayas Regional Development Council, the Region Eight Administrators League, the Department of Science and Technology and the Department of Tourism. Moreover, the National Tourism Week and World Tourism Day is also commemorated every last week of September. Thus, it was decided that in order to save on government’s resources and time, all of these commemorations will be observed during the 3rd Quarter General Assembly of REAL on September 27. Expected to attend the Joint Assembly are about 200 participants from the EVRDC executive committee, REAL officers and members, concerned local government units, Eastern Visayas Federation of Information and Communications Technology, Eastern Visayas Chamber of Commerce and Industry Officers and local Chamber presidents, and officers of the Association of Tourism Officers of the Philippines, Eastern Visayas chapter. The Convergence Assembly hopes to strengthen strategic alliances in pursuit of the realization of the Philippine Development Plan 2011-2016 goal of creating rapid, inclusive and sustained socio-economic growth. It also aims to increase synergistic partnerships for the attainment of the Eastern Visayas Regional Development Plan vision of making Eastern Visayas a tourism haven and a leader in agri-business and ICT, where related activities in agriculture, services and industry are cognizant of environmental sustainability, and where men and women are secure, self-sufficient and economically empowered. Director Laceras called on all invited participants to attend the first convergence assembly of the RDC and REAL. CAMP SEC. 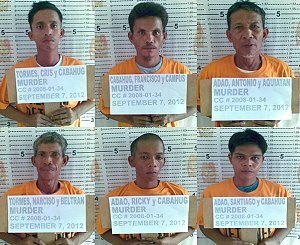 RUPERTO K. KANGLEON, Palo, Leyte – After more than four years of hiding, six murder suspects in Leyte were arrested by the Regional Special Operations Group 8 (RSOG8) Thursday afternoon. “This operation forms part of the implementation of the directive from higher office in line with the 10-point agenda of the Chief, PNP”, PCSupt Elmer Ragadio Soria, Police Regional Director said. The Police Regional Office 8 had intensified the LOI Manhunt: Charlie, the PNP’s campaign for the arrest of wanted persons, he added. Nabbed were Francisco Cabahug alias Buntol, Cris and Narciso Tormis, all residents of Sitio Canmanasa, Brgy. San Agustin, Palo, Leyte and Santiago, Antonio and Ricky Adao, all residents of Brgy. Capirawan, Palo, Leyte. The police regional director said operatives of the RSOG8, Regional Public Safety Battalion 8 (RPSB8) and the local police collared the suspects in their hideouts in Brgys. San Agustin and Capirawan, Palo town. The arrests were conducted on the strength of alias warrant for murder issued by Hon. Judge Frisco T. Lilagan of RTC Branch 34, 8th Judicial Region, Bulwagan ng Katarungan, Tacloban City docketed under Criminal Case No. 2008-01-34 with no recommended bailbond for their temporary liberty. Soria added that the arrested persons are wanted for the murder of one Juanito Guittierez sometime in November 21, 2007. The incident started on a dispute over a piece of land between the victim and the suspects. After the perpetration of the crime, the suspects went into hiding. Arrested suspects were detained at Palo Municipal Police Station for proper disposition. Maintaining the dictum that “more criminals behind bars and more policemen in patrol means much safer streets,” Soria said accounting for wanted crime offenders particularly those involved in heinous crimes will continue to be a major thrust of his administration. From January 1 to August 31 this year, 1644 offenders wanted by the law for involvement in various criminal cases were rounded up by different line units of PRO8 in line with its continuing operation to account wanted persons and thus fast track the processes in the Criminal Justice System to achieve justice, Soria added. GOVERNMENT CENTER, Palo, Leyte – The Department of Science and Technology in Eastern Visayas is host of this year’s Visayas Cluster Science and Technology Fair on September 24-28, 2012 at the Tacloban Convention Center. DOST-8 Regional Director Edgardo Esperancilla informed that the activity will be participated in by the DOST Visayas Cluster composed of Western Visayas, Central Visayas and Eastern Visayas. The Fair will showcase products and services that transformed science into useful and value adding innovations to meets the needs of Micro Small and Medium Enterprises and other clients in the Visayas Regions and throughout the country. The DOST Director informed that the activity aims to strengthen public and private partnerships and create avenues for utilization of Science and Technology in addressing pressing problems both locally and nationally as well. One of the highlights of the said activity is the technical sessions with different themes per day. On September 24, the theme is “Putting Science into Disaster Risk Reduction and Management: Doing the Best for the Worst.” A technical session will be conducted at 2:00 0’clock to 5:00 o’clock in the afternoon with the topics, PHIVOLCS and Risk Management and Project NOAH. “Science, Technology and Innovation (STI) in Food” is the theme for September 25. The Technical Session will be from 9:00 o’clock in the morning to 5:00 o’clock in the afternoon. The topics are STI for Increasing Food Shelf Life and Quality (Packaging for Food Products, Water Retort, Immersion Freezer and Vacuum Packaging Machine); Food Innovation and Technologies to Address Malnutrition; Clean Production for Food Processing Industry; and Food Safety: How Safe Is Your Food. For September 26, with the theme “Investing on Green Technologies,” the topics for the 9:00 in the morning to 5:00 o’clock in the afternoon, are Urban Gardening: Hydroponics, Vertical and Wall Gardens; Farmer-Scientists Program and S&T-Based Organic Farming; Natural Dyes; and Philippine Land Fill Gas Forum. Finally on September 28, the theme will be “Putting Science, Technology and Innovation Together in Improving Your Business.” The topics for the 9:00 o’clock to 11 o’clock in the morning technical sessions are DOST’s Small Enterprises Technology Upgrading Program (SETUP) and Venture Financing: the TAPI Way. Due to limited slots in the technical sessions, Director Esperancilla called on the national agencies in the Region to confirm their attendance on or before September 12. TACLOBAN CITY – The Philippine Information Agency Director in Eastern Visayas lauded the Department of Public Works and Highways Region 8 Director for his prompt action on the issue of the water expansion project in Tacloban City. Director Olive Pecson Tiu, in a radio interview, said that during the weekly Harampang Ha PIA on September 6, Director Rolando Asis told the local media that he will act on the request of LMWD for exemption on the Department Order No. which calls for putting up of pipes at least nine meters from the center line of the National Road, upon receipt of said letter from LMWD. Director Tiu, later found out that the LMWD has already earlier submitted such letter to a personnel of DPWH Region 8. The PIA director then called up the DPWH Regional office and was told that indeed the letter was received by said personnel but he has not yet given the letter to Director Asis. PIA was given the assurance that said personnel will discuss the request with Director Asis that day, Friday, September 7. True enough, on September 7, Director Asis issued a Memorandum to District Engineer Arnaldo Bonifacio of the DPWH Sub Engineering District in Tacloban City, copy furnished the General Manager of LMWD Engr. Nestor Villasin, advising Engr. Bonifacio to allow the LMWD to continue or to resume the pipe installation in Tacloban City. In his September 7 memo, Director Asis ordered DE Bonifacio to allow LMWD to continue with the pipeline installation in areas where there are no illegal settlers, violators and encroachers of the Road Right of Way as provided for in Section 13 of Presidential Decree No. 17. Asis added that it should be taken into consideration that the pipe installations shall be maintained at 9.0 meters from the center line of the National Road. The same memo provided that a deviation on the pipe laying may be made if and when the removal of the illegal structures or obstruction yet cannot be done at this point of time for justifiable reasons. Several local media practitioners extolled the role PIA played in the early resolution of the issue. Had the PIA stopped after being told by DPWH that it has yet to receive the request, then both parties would still be waiting for the action of the other, without knowing where the bottleneck was. However, Director Tiu said that it only did its mandate to help bring out the truth and to provide the people adequate information about certain issues. CAMP LUKBAN, Catbalogan City – The 8th Infantry (Stormtroopers) Division, Philippine Army has installed two (2) new commanders in Leyte and Samar provinces on September 3 and 4, 2012 respectively. 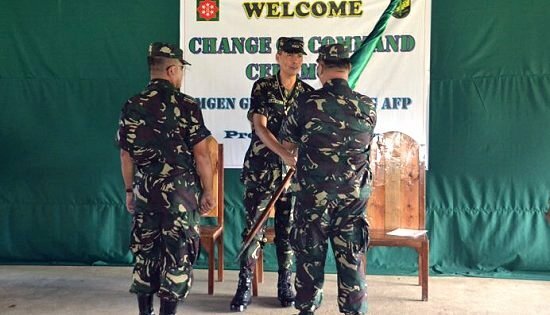 The Change of Command Ceremony was held at Headquarters 78th Infantry Battalion stationed in Brgy. Abuyugon, Burauen, Leyte and at Headquarters 43rd Infantry Battalion stationed in Brgy. Erenas, San Jorge, Samar wherein Major General Gerardo T Layug, Commander of 8th Infantry Division was the presiding officer and guest of honor. LTC Adonis R. Bajao replaced LTC Nolasco A. Mempin as the new battalion commander of 78th Infantry Battalion while LTC Glenn June C. Calambuhay replaced LTC Angel I. Madarang as the new battalion commander of 43rd Infantry Battalion. The outgoing commanders will assume posts at the division headquarters within the week. Hon. Fe Sudario Renomeron, Municipal Mayor of Burauen, Leyte was one of the special guests during the change of command ceremony at 78th IB in Burauen, Leyte, while Hon. Ronaldo P Aquino, Mayor of Calbayog City; Hon. Melissa Dela Cruz, Mayor of Matuguinao, Samar; Hon. Charlito Corñejos, Board Member; Hon Marcelina D Yu, Vice-Mayor of San Jorge, Samar were the special guests during the change of command ceremony at 43rd IB in San Jorge, Samar. MGen. Layug states that the change of command of the Battalions in the region is part of the time-honored tradition in the military that connotes not only the smooth transition of leadership but also the passing of responsibility from outgoing to incoming commanders. “The event is also an opportunity for every unit to renew its commitment to serve the people and inspire them to continue the untiring performance in winning the peace in the region,” added Layug. GOVERNMENT CENTER, Palo, Leyte – The San Juanico Bridge which connects Leyte and Samar provinces remains to be safe despite sustaining shallow cracks on some of its piers, Department of Public Works and Highways Region 8 Director Rolando Asis informed. 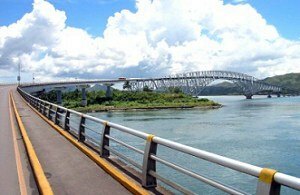 The damage sustained by the San Juanico Bridge is minor and must not cause any alarm on the commuting public, Director Asis told the local media during the Harampang at PIA held at the PIA Regional Office here, recently. “Our motorists have nothing to worry about. The bridge is okay and remains passable,” Director Asis said. Director Asis disclosed that he has already created a team that will thoroughly look into the piers or columns of the bridge so these could be fixed immediately considering its importance in the transportation system not only in the region but in the entire country. “We have noticed some cracks at the three piers or columns of the San Juanico Bridge which could be due to the earthquake. But these damages are not alarming as these could be fixed immediately,” Director Asis said. A DPWH team conducted a rapid assessment on the San Juanico Bridge the day following the earthquake and the team reported that no damage to the structure was observed. Based on the DPWH inspection, pier 5, 33 and 34 sustained “minor cracks” which could be the result of the earthquake. Pier 5 is located at the Leyte side while piers 33 and 34 are located at the Samar side, Director Asis explained. It may be recalled that the entire region and some parts of the Visayas and Mindanao was jolted by a strong 7.6 magnitude earthquake last August 31 which also caused minor damages to various public infrastructures in Eastern Visayas. San Juanico Bridge which is a major landmark in the Region, spans 2.1 kilometers, has more than 50 piers and is considered to be a vital installation in the region. The bridge, located along San Juanico Strait, was constructed at a cost of more than $12 million in 1969 and was finished in 1973. Souvenir photo of seventeen (17) former rebels with Lt. Col. Cabansay, Ms. Malate and Ms. Mangalao at 19IB’s Sandiwa Hall after the three day livelihood training. 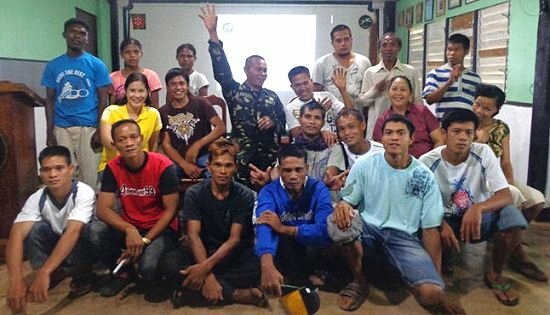 KANANGA, Leyte – A three-day livelihood skills training was conducted by the Leyte Provincial Social Welfare and Development Office to seventeen (17) former rebels at Headquarters 19th Infantry (Commando) Battalion from September 3-5, 2012. For three days in 19IB, the former rebels were lectured about agriculture, particularly animal husbandry and farming methods. Values development was also highlighted during the activity. Mrs. Gwyndalynn Malate, focal person for the Former Rebel Program (FRP) said that the training was a pre-requisite before the former rebels can receive the livelihood financial assistance amounting to P50,000 each from the Office of the Presidential Adviser on the Peace Process (OPAPP). “The Provincial Government is so concerned about the needs of former rebels. In fact, Gov. Carlos Jericho Petilla is pushing the implementation of the Comprehensive Local Integration Program (CLIP) in order to uplift their lives,” Malate stressed in an interview. On August 23 this year, Provincial Government of Leyte released the Basic Immediate Assistance (BIA) amounting to P10,000 to each former rebel. Malate further disclosed that they will be forwarding the pertinent documents of the beneficiaries to OPAPP for immediate release of funds. Exact date on the release of aforesaid funds cannot be determined as of this time. In his message during the closing ceremony of the three-day training, Lt. Col. Jeffrey Cabansay, Executive Officer of 19IB hoped that the efforts of government would encourage the remnants of NPA rebels in Leyte to surrender and return to the main stream of the society. Likewise, Lt. Col. Joel Alejandro Nacnac, commanding officer of 19IB lauded the support of the Provincial Government of Leyte in its sincere implementation of the Comprehensive Local Integration Program (CLIP). CEBU CITY – “Power is in the business that improves lives, including that of all the people in the Philippines, but success will not be acquired overnight but needs constant diligence,” Ma. Theresa G. Catipay, executive director of the Ramon Aboitiz Foundation Inc. (RAFI) Micro-finance, said in her message during the second general assembly of Bohol Area on August 18 at the Bohol Wisdom School Gymnasium, Tagbilaran City, Bohol. With the theme, “Kakugi, Binhi sa Kaugmaon”, the event drew 1,081 women micro-entrepreneurs from Tagbilaran, Talibon, Tubigon, and Ubay branch of operations. The nanays actively participated in the various activities. Top performing clients in various categories such as the Most Outstanding Client, Most Outstanding Chairwoman, Most Improved Group and Client, and Conscientious Saver were recognized and were given cash prizes. The group with the most artistic banner was also awarded. The Most Outstanding Client award was given to Claudia C. Celis from Inabanga, Bohol. The general assembly is conducted once every three years in the area to honor RAFI Micro-finance clients who remained loyal to the program for five years or more and to acknowledge model women micro-entrepreneurs. “No dreams will ever come true unless you wake up and realize them,” Most Outstanding Client from Leyte Zenaida Nuñez, who was gave an inspirational message during the event, said. Nuñez mentioned knowledge, skills, and attitude as keys to success. “If you are not skilled in hairstyling and rebonding, do not venture into opening a beauty salon, but instead think of the skills you have and apply it to your business,” she advised fellow clients. In partnership with Pilmico, the participants were given training on hog raising. The Department of Agriculture (DA) Bohol Experiment Station also shared their expertise in cassava food processing. Nanays also showcased their talents, and some of their products were displayed in a trade fair. Children who were around during the event were given art kits through RAFI's Dolores Aboitiz Children’s Fund (DACF). Approximately 350 pre-determined women clients and their children received free medical consultations, and initial dosage of medicines and vitamins. Cervical screening was also conducted to the beneficiaries of the medical mission in collaboration with RAFI's Eduardo J. Aboitiz Cancer Center (EJACC) and volunteer doctors and nurses from Cebu and Bohol. Micro-finance is a program under the Micro-finance & Entrepreneurship focus area of RAFI, providing financial resources and know-how to women micro-entrepreneurs to nurture financial independence and entrepreneurship. Other focus areas of RAFI are Integrated Development, Culture & Heritage, Leadership & Citizenship, and Education. For more information on RAFI Micro-finance, please contact 418-7234 loc. 707 and look for Val Gatchalian, or visit www.rafi.org.ph or www.facebook.com/rafi.org.ph.